My husband has had his heart set on doing some solid ATVing for awhile so I decided that a great anniversary present would be a whole afternoon in the back country with 500CC at our disposal. 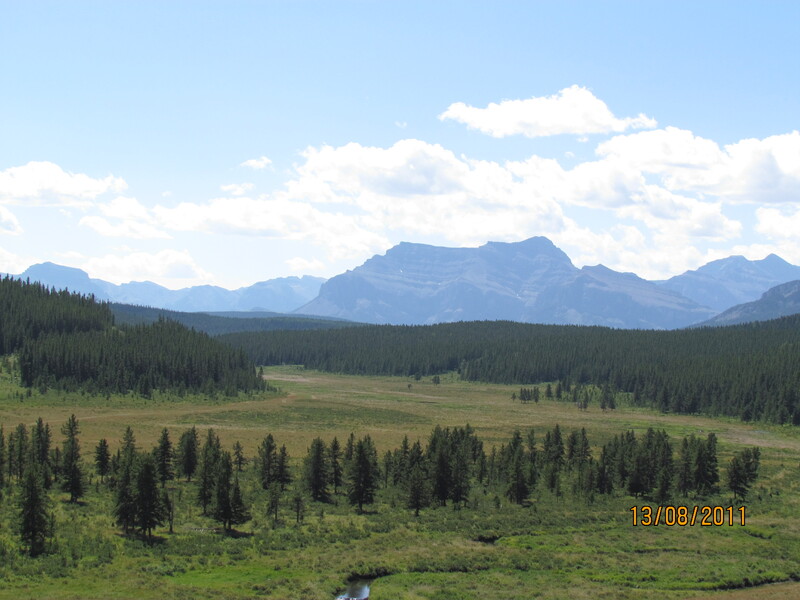 We hooked up with Canmore Quads http://www.canmorequads.com/ on a gravel road near the Ghost Lake area. You gotta love the place you are living in when the first thing the guide says is “I am not taking my shot gun today- the bears seem to be getting full” and there begins our ATV adventure! 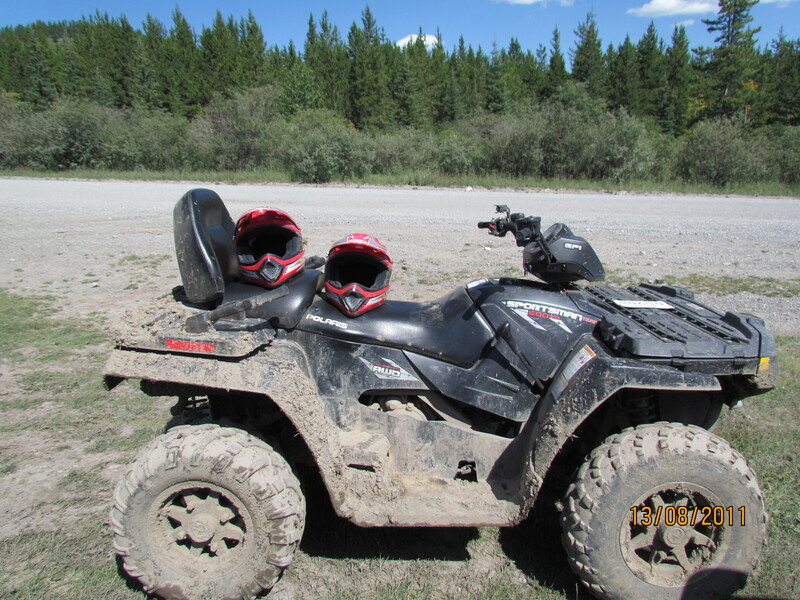 I have to say that Canmore Quads was excellent; easy to book with, responded promptly to emails and our guide was very relaxed and knowledgeable. There was only one other couple so no line of 20 quads first waiting for last and so on… so we knew we would have some freedom. 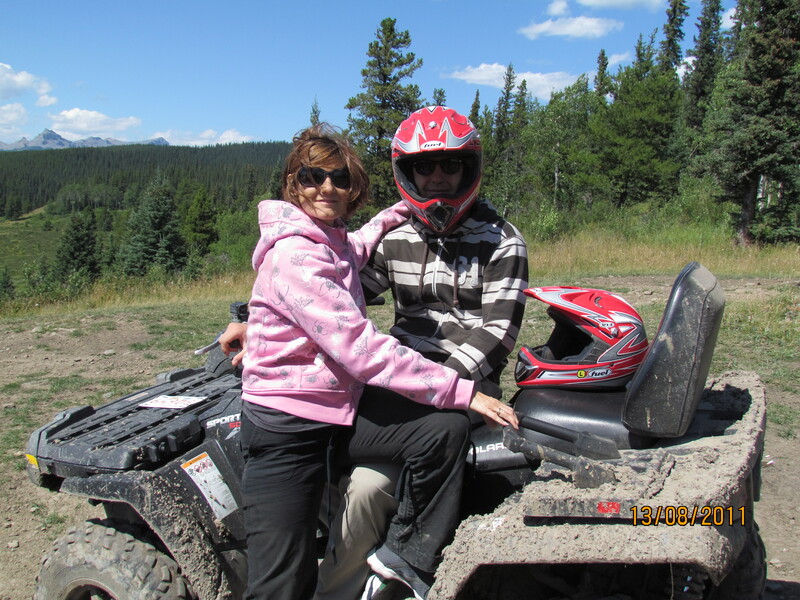 I rode on the back of the ATV-which ends up being a good deal as riders go for free! Thing is, because you never know what life may toss your way….everyone-even riders must drive a practice run-just in case a disaster strikes we all need to have the skills. So I decided to go first- it was a task I wasn’t really looking forward to so I wanted to get it over with. Darek strapped in behind me and walked me through starting everything up and then we were off!!! Darek truly doesn’t trust my judgement of speed and I firmly believe he has no faith in my ability because all could hear was “slow down baby, baby go slowly, why are you going so fast, slow down” haaa haaaa!!!! Truth be told the machines (Polaris) were so easy to use and I felt like I had more control over my ATV then I have ever had over a car still; Darek put a swift end to my ATV driving career! Honestly though, sitting on the back watching the world pass by on a sunny Saturday afternoon is a pretty good way to pass by a couple of hours. Now a lot of folks out ATVing see wildlife, we never see any wildlife ever and this trip was no exception – we saw only cows! The whole trip was about 30 miles with astonishing views of the mountains that we simply would never have seen this otherwise, ATVing is really an outstanding way to see the back country beauty. This year with all the rain and the late start to summer our skies are filled with dragonflies and butterflies- so much so that butterflies were crashing into us- it was crazy! The wildflowers this year are spectacular and a usually parched and dry area of the world was a lush green paradise this year. We bounced and jiggled through puddles and over bridges, we stopped to look at bear scratches on trees and smell the amazing mountain air. We met a man who started ATVing when he was 69 and is now ATVing non stop in his 80’s! It was a very pleasant way to pass an afternoon…and then….something happened on the journey back to the base…Darek found the throttle! Gone were the moments of gaping around hardly holding on pointing out butterflies, I was holding on for dear life. Parts of me were jiggling that I didn’t even know could jiggle and the sweet driver who had turned around every few minutes to ask “how are you doing honey, are you having fun” was replaced by a man in a primal battle with nature- passengers need not apply! Yet in this white knuckle ride of death is were I think we found the true heart of the ATV addiction and interface with nature that no other mode of transportation can afford you. The trail we conquered couldn’t be done in a large vehicle, we wouldn’t have hiked that many miles in dangerous country and a motorbike wouldn’t have tackled the potholes and hills in the same way our mighty 4 wheels munched through even the toughest terrain. So did I have fun? Absolutely, would I do it again- for sure, is Darek already looking at what ATV to buy-100%!!! In fact he has expressed interest to go snow ATVing so stay tuned!! ATVing is a fun and fairly affordable hobby that gives you vantage into places you would not otherwise go and when your thumb finally finds the throttle….well then my friends its a whole new ballgame!!! 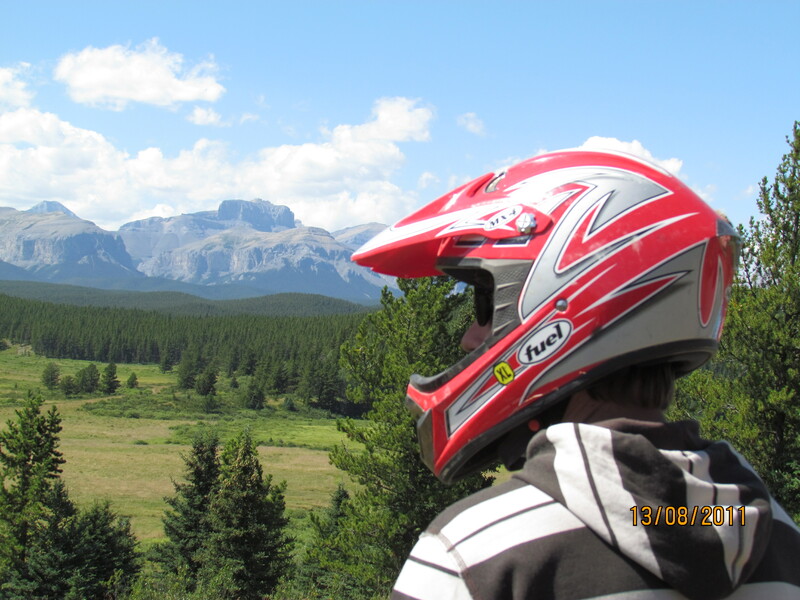 So if you are looking for a high octane way to explore the rockies, give Canmore Quads a call! !